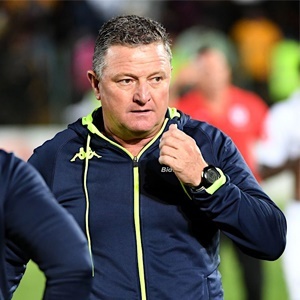 Cape Town - Wits coach Gavin Hunt has revealed that he is not willing to decide yet as to whether to sign troubled former Mamelodi Sundowns left-back Siyabonga Zulu. Zulu was released by the Brazilians in January following a number of disciplinary infringements which included missing training as well as a failure to comply to team rules. The player was also struggling to break into the first team with Tebogo Langerman and Lyle Lakay clearly ahead of him in the pecking order. Nonetheless, it appears the 25-year-old is attempting to re-build his career as he requested to train with the Clever Boys recently in order to regain top conditioning and sharpness. With that said, indications suggest Wits are unlikely to offer Zulu a deal as they already have Sifiso Hlanti and Lehlohonolo Nonyane available in the left-back department. When asked whether the Students would offer a contract to the former Platinum Stars man, Hunt said: "He's just asked to come and train. I'm not going to make a decision now about that. So, we will see." Wits are next in action on Saturday when they face Chippa United in a Nedbank Cup quarterfinal at Bidvest Stadium.